Oh this Trilogy! I didn’t even know how to write this review. I finished Lion Heart and I didn’t know how to put my opinion in to words. I was so sad to see this series end ­on one hand and on the other I thought that this novel was the least strong in the series. 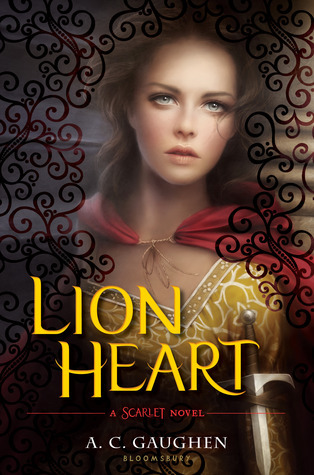 Lion Heart begins with Scarlet’s imprisonment by Prince John. She has been locked away for months and after she escapes she reunites with her Grandmother, rather than Rob, to figure out Prince John’s next move. This is the crux of what I didn’t like about this book. My favorite thing about Scarlet and Lady Thief were the interactions, and camaraderie, between Scarlet and Rob and in Lion Heart there was less of that. Still, my love for Scarlet knows no bounds! She is the kind of female character I like to see in YA. Scarlet is fierce, independent, loyal, and despite the odds being stacked against her she still perseveres and doesn’t compromise her own morals to reach her goals. My favorite thing about this novel was all the swoons. Scarlet & Rob are a couple you can’t help rooting for and they kept me guessing in this novel. They love each other that much is clear, but they definitely kept me on my toes wondering if they were going to be able to stay together or if Prince John, and Nottingham, was going to tear them apart. Overall, I loved this series. If you haven’t read it yet I seriously suggest a binge read! Although Lion Heart was my least favorite installment it was still one of my favorite reads so far in 2015. Just got Scarlet a couple of weeks ago and I can't wait to dive in. Hopefully, I'll love it and immediately get the next one. Great review!! 'Oh, this trilogy' pretty much sums it up for me! <3 I have yet to read the final book, but I adored the first two.